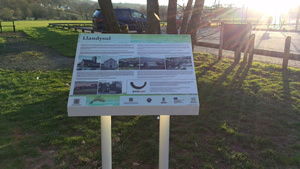 Llandysul grew up around the original Christian community founded by St. Tysul in the 6th Century. He was the cousin of St David, our Patron Saint, and the grandson of the founder of Ceredigion, Ceredig. The present church was built in the 12th century on the foundation of St. Tysul’s sanctuary. A number of prehistoric sites are found in the area, such as the Iron Age hill fort at Pencoedfoel (SN 424427) and farm site excavated during the building of the new Gomer Press building (northern end of the bypass). This indicates that the area has been settled and farmed since the Neolithic period (4,000-2,500 BC). The mother of celebrated national hero, Owain Glyndŵr, was Princess of South Wales and her family home was around Llandysul. In addition to the Church in Wales, there are at present three places of worship in the village - Graig Unitarian Chapel, Seion Congregational Chapel and Penybont Baptist Chapel, the latter being situated in Pont-Tyweli. The Ebenezer Baptist Chapel in Lincoln St and the Wesleyan and Calvinistic Methodist Chapels, closed down many years ago; the defunct Wesleyan Chapel became the home of Ieuenctid Tysul Youth. 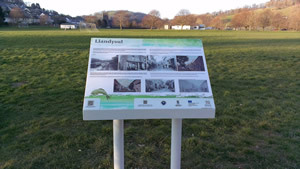 Education has always been a high priority in Llandysul, evidenced by the number of schools run in private houses before the opening of the Board School in 1838 on Sunny Hill. A new Board School (known as Ysgol Uchaf) was built in 1896 and became the home of Telynau Teifi, The Harp Centre of Wales in 2005. The National School (known as Ysgol Isaf) was opened in 1851 and now houses the Library. In 1860, the Rev. William Thomas (known as Gwilym Marles, and Dylan Thomas’ great Uncle) began the Grammar School. As pupil numbers increased he moved to Myfyrgell on Seion Hill. A larger Grammar School was built by public subscription and opened in 1895. This later became Ysgol Dyffryn Teifi. The Memorial Park was opened following World War I and is dedicated to all who served from the area. Since 1988, Llandysul has been twinned with Plogonnec, Brittany. Grid in the 1955. Over the years the river has also facilitated recreational pursuits, such as fishing, otter hunting and, more recently, canoeing. The Teifi and the stone bridge have formed part of defensive systems in two major wars. In the Civil War (1642-51) the bridge was blown up by the Royalists to slow the Parliamentarians crossing the river. 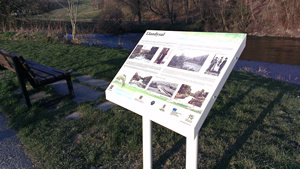 The soldiers were forced to ford the river at a site still called Rhyd y Milwyr (Soldiers’ Ford). During the Second World War the River Teifi was used as part of the invasion defence line. The outline of the concrete base of one pill box is still visible on the Carmarthenshire side of the river. The two counties are connected via the stone bridge which provides the link for transport, as well as a pedestrian bridge alongside. In earlier days, walking access was also provided via two suspension bridges, one of which was located over the ancient ford by the Parish Church. The coming of the railway in 1864 had a significant effect on the village and its way of life. Although situated in Pont-Tyweli, it was called “Llandyssil Station”. A livestock market was conveniently situated next to the railway station. The railway created economic opportunities for farmers who could now move produce and stock quickly in and out of the area. The Cilgwyn Hotel, opposite the station, offered accommodation for travellers, whilst the other hotels, such as the Porth and the King’s Head, collected passengers and luggage by pony and trap. Businesses and shops in the community on both sides of the river, included grocers, ironmongers, saddlers, butchers, printers, tailors, shoemakers, milliners, drapers, confectioners, chemists, bakers, blacksmiths and cabinetmakers. Cafes and pubs provided refreshments.